This enormous steel disc rises from the vegetation like a UFO split in two. Inspired by early exploration of the moon, Einstein’s ideas, and scientific advancement, Roy Leadbeater artistically re-creation the explosion that created the universe. As a young Calgary-based sculptor trying to get his work noticed, Leadbeater toyed with the idea of a lunar-looking sculpture imagining what the surface of the moon would look like close up. However, before he could finish the project, Neil Armstrong visited the moon. Thus, space travel and exploration had exposed the moon’s mystery. Influenced by science generally, and Albert Einstein specifically, Leadbeater had an epiphany. The big bang theory was so riveting for him that he reframed his lunar disc by shattering it to look like it was being ripped apart. It became an artistic re-creation of the explosion that created the universe. The aptly named Genesis became one of Leadbeater’s most famous pieces. 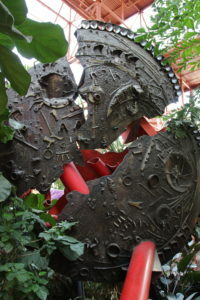 Situated in the greenery of the Citadel’s Lee Pavilion, the metal pins and torn disc make it appear as though a spaceship crashed into the jungle. A disc of metal is molded to look pockmarked, like the surface of the moon or a meteorite. The disc is then fragmented into two bits, but the cut isn’t clean – it’s a shocking, jagged break. While the idea for Genesis was born in the years that man was going to the moon, it took a decade and a half for the sculpture to evolve. It finally came into public view in 1984, taking its place at the Citadel Theatre. Biography: A descendant of the famous potter Josiah Wedgwood, Roy Leadbeater was born in Ashbourne, Derbyshire, England in 1928. After serving in the British Merchant Navy and also as a member of the British police who helped keep peace in post-WWII Palestine, he studied drawing at the Birmingham School of Art. He emigrated to Canada in 1953 and studied drawing on a part-time basis at the University of Alberta under H.G. Glyde.